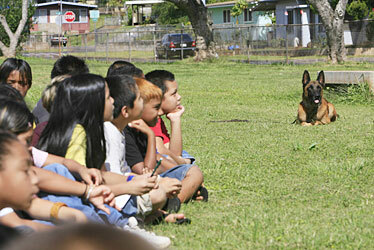 Rudi, a Belgian malinois on the Honolulu Police Department canine force, showed Kaala Elementary School fifth-graders his focus and concentration yesterday during a demonstration in Wahiawa. Police also brought a helicopter and tactical vehicles to promote public safety and awareness. 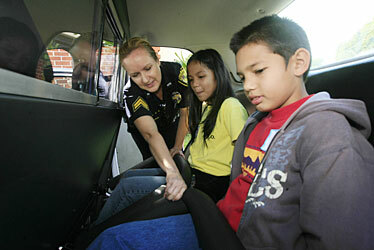 Police officer Josie Kaanehe showed fifth-graders Reno Olsen and Crystal Fernandez how it feels to be strapped in the back of a squad car. 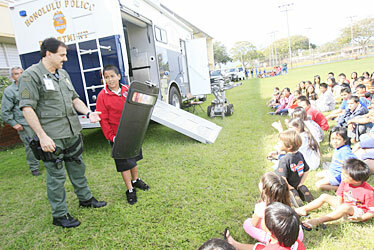 Fifth-grader Lopaka Souza-White tried to lift a bulletproof shield with the help of Sgt. Thomas Carreiro.